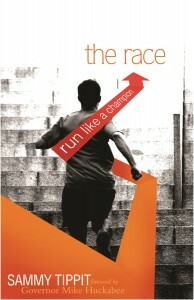 The Race, a book about life principles learned from the biblical imagery of the athlete, especially the runner. The Race contains testimonies of some of the world’s greatest sports figures — their successes and failures, triumphs and tragedies, the pain suffered and the lessons learned. The running principles provide wisdom and inspiration for athletic performance and health benefits for readers. The biblical truths direct the reader down the path of spiritual renewal and personal growth. Sammy Tippit uses the imagery of the runner to show the reader the way to build the character, strength and endurance of a champion. It includes testimonies and interviews with Ryan Hall, American record holder for the half marathon; Charles Austin, Olympic and American record holder for the high jump; and Jerry Stovall, former All-Pro football player and former head football coach at Louisiana State University. For further information about the book, The Race, go to the book’s web-site HERE!!. The Race can be purchased HERE! !